Dharamshala(Himachal Pradesh)[India], Nov.2 : Former Himachal Pradesh chief minister and senior Bharatiya Janata Party (BJP) leader Shanta Kumar has called on the Centre to honour Tibetan spiritual leader, the Dalai Lama, with the country's highest civilian award, the Bharat Ratna. Speaking at the release of his book 'Himalaya Par Lal Chaya' at Tsuglagkhang, at the main Buddhist temple in Dharamsala,Kumar said," "I strongly urge the Indian government to confer the prestigious Bharat Ratna Award on the Dalai Lama. It would be a great example of India's faith on Tibet." The 14th Dalai Lama also launched another book, 'If Autumn Comes', written by Kumar's wife. Crowd visited the Minneapolis Convention Center just to get a glimpse of one man, the Dalai Lama. On Sunday morning, nearly 3,000 people attended the Dalai Lama's appearance to listen to his short talk and for the Tibetan New Year celebrations. Since the March 2014 New Year, it was the first time that the spiritual leader of Tibetan Buddhists visited the Twin Cities. There had been concerns over the Dalai Lama’s health since he went to Mayo Clinic in Rochester in January. While talking to the crowd, he said that he'd been getting treatment for prostate issues there for a decade and assured everybody that he is healthy and well. Hospital officials shared that Tibet's exiled Buddhist spiritual leader, the Dalai Lama, came for a routine annual check-up, but has now left the Mayo Clinic in Rochester, Minnesota. On the advice of doctors, the Dalai Lama has canceled visits in America this month. For now, there are no details about whether he was ill or there was any other problem. Mayo spokeswoman Ginger Plumbo has confirmed about the release of the Dalai Lama from the hospital, but did not comment more details on the matter. A number of Tibetans dressed in traditional clothes were present at the Mayo Civic Center on Wednesday morning to greet the Dalai Lama. The Dalai Lama has assured about his health and said that doctors have encouraged him to take rest, but his physical condition in general is very good. Dharamsala, May 17 : Tibetan spiritual leader the Dalai Lama Saturday congratulated BJP's prime ministerial candidate Narendra Modi for his party's decisive victory in the Lok Sabha election. The Nobel Peace Laureate in a letter to Modi said India was the world's largest democratic nation and the most stable in South Asia with a tradition of "ahimsa" (non-violence). He said he took pride in citing India as a living example of unity in diversity, an ancient country in which all the major religions of the world flourish and from which other countries could learn. 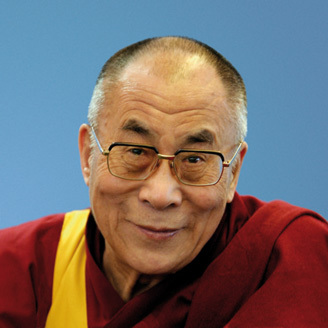 Washington, March 9 : Dalai Lama has revealed that he supports gay marriage. The exiled Tibetan spiritual leader told talk show host Larry King that if two people, a couple, really feel that getting married is more practical and satisfying and both sides fully agree, then ok, ABC News reported. He, however, added that each country had the right to choose for themselves whether to legalize gay unions or not. Beijing, Feb 21 : China has asked the United States to cancel the planned meeting between President Barack Obama and exiled Tibetan spiritual leader the Dalai Lama. In a press release, Foreign Ministry spokeswoman Hua Chunying said China has urged the US to take its concerns seriously and to not facilitate the occasion for the Dalai Lama to conduct anti-China secessionist moves. Her comments came in response to the scheduled informal Obama-Dalai Lama meeting on Friday in the White House . She urged the Tibetan issue is a domestic affair for China, arguing that there is no other country that bears the right to interfere. Dharamsala, Dec 6 : Two years ago, Tibetan spiritual leader Dalai Lama called off a trip to South Africa as it was "inconvenient" for that country's government to grant him a visa and missed a chance to meet Nelson Mandela again. After cancelling his trip in October 2011, the Dalai Lama, winner of the Nobel Peace Prize in 1989, had said: "I am very sad and very much (hoped) to see Nelson Mandela, who is now very old. So now I doubt whether I can have another occasion to meet him." An aide of the Dalai Lama said Friday: "His Holiness' desire to meet former president Nelson Mandela remained unfulfilled." 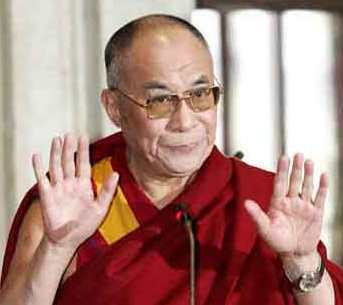 New Delhi, Nov 29 : Tibetan spiritual leader, the Dalai Lama, Friday advised Indians to get regular eye check ups done. "A society that gives importance to their health continues to thrive," he said at the launch of the country’s first institute dedicated to glaucoma and retina problems here. Set up by Eye Q, a chain of eye care hospitals, the super-specialty centres offer the latest technology and medical skills to benefit people suffering from complicated cases of glaucoma and conditions arising in the retina. It offers services like comprehensive screening examinations, eye pressure tests and intricate surgeries. Dharamsala, Aug 8 : Tibetan spiritual leader the Dalai Lama Thursday expressed happiness over the successful heart surgery of former US president George W. Bush and wished him swift recovery. The Nobel Peace laureate wrote a letter to Bush, 67, after his Tuesday's surgery. Dhar amsala, July 1 : Tibetan spiritual leader the Dalai Lama wants to pay his respects to his ailing friend and former South African president Nelson Mandela, an aide said here Monday. "His Holiness (the Dalai Lama) is keen to pay respects to his long-time friend Nelson Mandela, provided it doesn't cause any inconvenience to anyone, individuals or the government there," an aide of the Dalai Lama told IANS. "If South Africa is comfortable with his visit, he would be happy to meet personally Mandela's family members," he added. Dharamsala, April 11 : Tibetan spiritual leader the Dalai Lama has described the people in his homeland as his "boss" and said they were setting themselves afire owing to the desperate situation there. "For years, I have considered myself a free spokesperson for the people of Tibet, but those people are my boss. Those who are pursuing this course of action are doing so not because they are drunk or beset by family problems but because of the desperate situation in which they find themselves," said the Nobel Peace laureate in Bolzano, Italy, Wednesday. Jaipur, Jan 25 : Revered spiritual leader the Dalai Lama has said that cordial relations between India and China were essential to maintain a genuine friendship. The 77-year-old spiritual leader said this on Thursday while attending the opening of the Jaipur Literature Festival in Rajasthan. He added that China has to learn a lot from its democratic neighbour India. Patna, Jan 4 : Tibetan spiritual leader, the Dalai Lama, on Friday said that the world is facing a moral crisis, and emphasised on self-discipline on the basis of moral ethics to combat it. Dalai Lama, along with Bihar Chief Minister Nitish Kumar, inaugurated a Buddha statue at a shrine here today. The Nobel laureate said that the ramping up police force would not resolve moral issues. Dharamsala, Sep. 26 : Tibet's spiritual leader, the Dalai Lama, has said that he will decide when he is "about 90" whether or not he should be reincarnated, and added that China should have no say in the matter. The Dalai Lama made the statement on Saturday in a 4200-word document issued after a gathering of leaders of the four schools of Tibetan Buddhism in Dharamshala. The fall-out of the meeting between the US President Barack Obama and the Dalai Lama in Washington on Thursday, will be more angry rhetoric from Beijing against American ‘interference’ in its sensitive internal affairs. Then, as one senior Chinese analyst told HT, Beijing will ‘manage’ to bring back the positive side of the Sino-US relationship. Last year, Beijing allowed its official media to raise aggressive anti-India rhetoric over the border dispute, the Dalai Lama and Arunachal Pradesh, before making diplomatic overtures for the sake of mutual economic growth. Bhubaneswar, Jan 11 - Tibetan spiritual leader the Dalai Lama arrived in Orissa Monday to inaugurate a newly-constructed Buddhist monastery in Gajapati district. The Tibetan spiritual leader arrived at Biju Patnaik airport in state capital Bhubaneswar in the morning and after a brief stay proceeded to Chandragiri in Gajapati district in a helicopter. During his stay in the Tibetan settlement, the Dalai Lama will inaugurate a five-storey monastery named Padma Sambhav Mahavira. Patna, Jan 6 : Hollywood star Richard Gere met the Dalai Lama in Bodh Gaya in Bihar where the actor is attending a five-day long religious discourse on Buddhism by the Tibetan spiritual leader, an official at a Tibetan monastery said Wednesday. A senior official associated with the Tibetan monastery in Bodh Gaya where the Dalai Lama is staying, said that Richard Gere is in Bodh Gaya to attend a religious discourse on Buddhism by the Tibetan spiritual leader. Patna, Jan 5 - Police Tuesday detained a man who was allegedly trying to enter a Tibetan monastery in Bodh Gaya in Bihar where the Tibetan spiritual leader the Dalai Lama is staying. The Dalai Lama reached Bodh Gaya, 110 km from here, on a chartered flight Monday. He is to give religious discourses for five days. Guards at the Tibetan monastery caught the intruder late Monday when he tried to sneak in. He was handed over to the police, Gaya Superintendent of Police Sushil Khopade told IANS over telephone.